Marshall M. Fredericks Sculpture Museum | Briefing session at Cleveland City Hall for "Cleveland War Memorial: Fountain of Eternal Life"
Briefing session at Cleveland City Hall for "Cleveland War Memorial: Fountain of Eternal Life"
Caption provided reads: Briefing session was held today in City Hall to clear the way for speedy construction of the Memorial Fountain. Marshall Fredericks, sculptor of the fountain, met with city officials in coordinating details. The committee is aiming at starting construction by Fall. Seated are Jay Katz, assistant service director; Fredericks; John Lucuoco, Properties director; James Hughes, architect; Tom Jones, commissioner of design. Standing are John R. Gillimore, civil engineer; E.R. 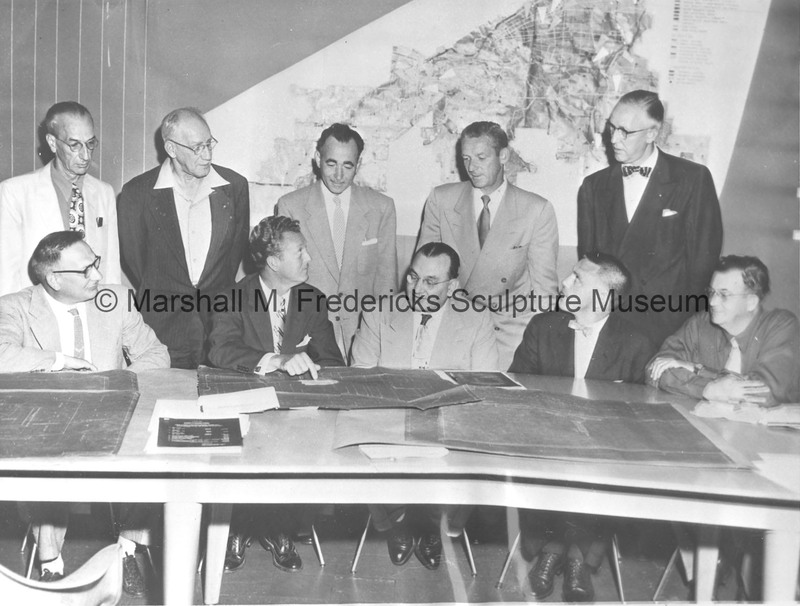 Graf, electrical engineer; Anthony Gattozi, commissioner of architecture; Harold Lausche, parks commissioner; and James Lister, City Plan Director. “Briefing session at Cleveland City Hall for "Cleveland War Memorial: Fountain of Eternal Life",” Marshall M. Fredericks Sculpture Museum, accessed April 22, 2019, http://omeka.svsu.edu/items/show/820.